JPMorgan Chase & Co. is in hot water again with at least three US government bodies, as it faces allegations of taking bribes. This time the company is expected to settle $130 million worth of fines to the Securities Exchange Commission, $72 million to the U.S. Department of Defense, and $62 million to the Federal Reserve Board of Governors, totaling $264 million. JPMorgan created a client referral program in its Asia Pacific (APAC) division in Hong Kong that broke anti trust laws. It allowed friends or relatives of some of their wealthy clients to get prestigious jobs with high incomes at the company based on one’s connections rather than on one’s skill qualification. After many years of investigating, regulators have finally decided it was time to take action. The Securities and Exchange Commission recently deemed it appropriate that cease-and-desist proceedings be instituted pursuant to Section 21C of the Securities Exchange Act against JPMorgan Chase & Co. The main issue with JPMorgan’s hiring scheme based on nepotism is that it violets the Foreign Corrupt Practices Act because many of its high net worth clients are state-owned entities (SOEs,) and therefore the client executives requesting employment for their relatives and friends were foreign government officials. Basically JPMOrgan “provided jobs and internships with the intent to corruptly influence the foreign government officials making the requests,” according to an SEC summary. And those influences have apparently paid off for JPMorgan. Over the past seven year period, the bank has hired roughly 200 interns and full-time employees at the request of its APAC clients, prospective clients, and foreign government officials. The referring state-owned enterprises entered into transactions totaled more than $100,000,000 in revenue for JPMorgan APAC or its affiliates during this period. JPMorgan wasn’t the sole bank to be investigated. HSBC, Goldman Sachs & Co., Credit Suisse, Deutsche Bank and UBS have all been queried about their hiring practices. The banking industry often undergoes scrutiny from regulators, but Donald Trump may change that once he is sworn in as President early next year. There is a lot of optimism on Wall. St. that Trump will reduce regulation for banking by repealing the Dodd-Frank Act. If that were to happen, banks will gain more opportunities to make larger profits. Over the past 1 month period, JPMorgan Chase and Co. shares have climbed 16% so far, which is an annualized rate of return of nearly 200%. Trump winning the U.S. presidential election certainly helped the stock markets, especially in the financial sector. Despite the recent run up, JPMorgan stocks are still fairly valued with a price to earnings ratio of 13.4x. The news about the corruption charges doesn’t seem to have hurt its stock price at all. When a company is making tens of billions of dollars in net income every year, $264 million in fines doesn’t seem like a lot in comparison. Perhaps if regulators want to deter bribing in the future they should impose harsher penalties for such hiring practices. 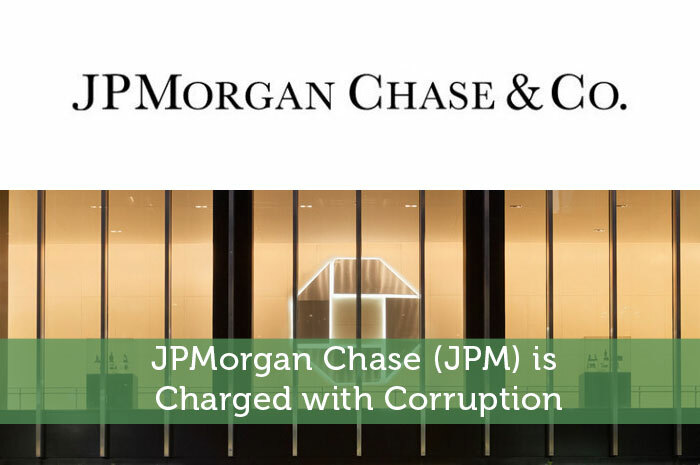 JPMorgan Chase & Co. is a financial holding company. The Company is engaged in investment banking, financial services. It operates in four segments, as well as a Corporate segment. Its segments are Consumer & Community Banking, Corporate & Investment Bank, Commercial Banking and Asset Management. This author has 75 shares of JPM as of writing this post.